Product prices and availability are accurate as of 2019-04-22 14:09:07 EDT and are subject to change. Any price and availability information displayed on http://www.amazon.com/ at the time of purchase will apply to the purchase of this product. 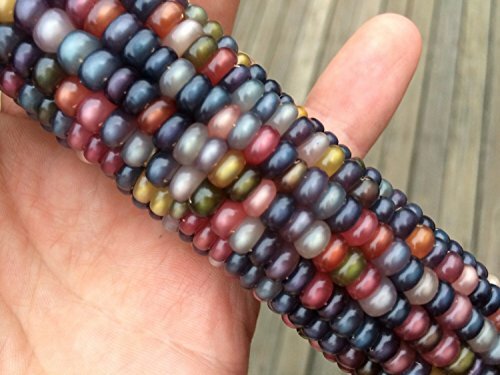 Glass Gem Corn is the most beautiful corn in the world. Extremely rare, this unique strain of flint corn was developed by Carl Barnes, who, before his passing, gave these seeds to friends who shared his passion in gardening. These seeds come directly from our small farm here in Fallsington, PA. We have been growing and breeding corn varieties for years and it has been a pleasure to work with Glass Gem. We have worked to improve the glassiness and color variation in this variety and can now boast 3 different strains including the Glass Gem, Rubies/Amber and Pearls/Sapphires. Glass Gem is a flint corn which can be made into a decent popcorn or ground into flour. We think it's so beautiful to simply look at. The pictures you see are actual photos of the corn we grew. Photos are expressed property of Sherwoods Seeds. Usage without consent will result in DMCA action. Each purchase comes with a free No GMO Decal!